Collectibility is a strange creature. It takes the best manufactured typewriters and makes them commonplace, yet transforms the most atrociously made machines into collectibles. Granted, scarcity is a powerful market force, but it is sometimes absurd. 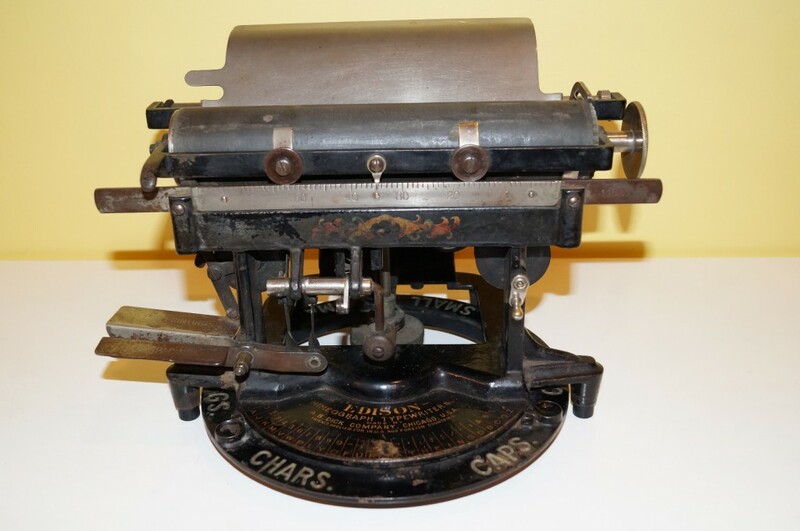 Consider the Edison Mimeograph Typewriter. Lately, one sold on eBay for more than $8,000 — the starting price was $850. The seller, quite sincerely, wrote, “This was a very slow index typewriter that did not type well and functioned with invisible typing, meaning that one could not see what they were typing so they had to lift up the carriage to inspect the work. Most contemporary typewriters of the time could cut stencils and also typed well[,] but the Edison could only cut the stencil well and typed poorly and still cost about the same as a keyboard typewriter.” The seller noted that, after a very short run, the manufacturer discontinued the typewriter in 1897. Collectible? Yes. First, it bears Thomas Edison’s name, the only typewriter to. Second, it is old and unique. Third, it is scarce. I am not so naive as to believe that such a typewriter would not command a high price. But, still, there is the principle of the matter: it wasn’t a very good typewriter. Had I been around in the 1890s, I would have opted for another typewriter. Postscript: That said, the Edison typewriter is rather pretty to look at. With these early machines, scarcity and sheer weirdness command premium prices. These are the typewriters that first fired my imagination when I started collecting seriously. However, I have come to appreciate the more “ordinary” but practical and well-designed typewriters — the ones you can use. And also, no one noticed the Visigraph that I got for $150.00 unopposed on a six day auction. Still not too sure how that happened… although I’m not complaining! Having sometimes spent more on a typewriter than I should have, I delight in such stories as yours. I frequently low bid an item in the hopes of acquiring it inexpensively… and sometimes that method works! I have a Edison mimeograph typewriter No. 1. that I would like to sale. Do you have any interest in this machine? An interest… but unfortunately not the funds! I do think you could find a buyer, though.